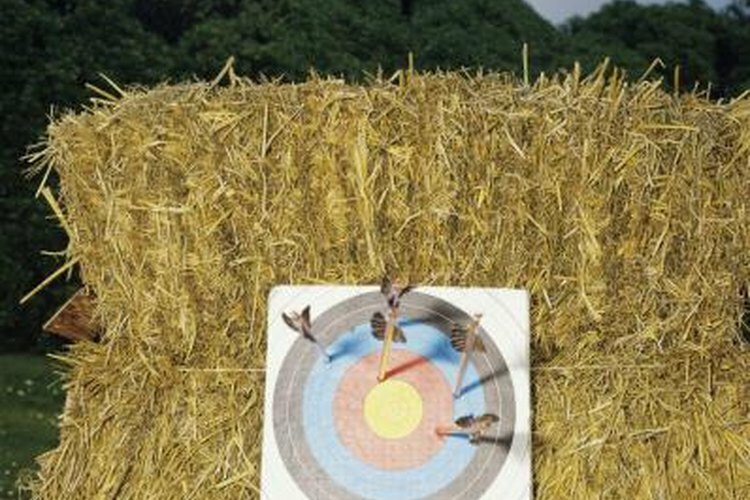 Hay bales make suitable targets, but they are neither durable, nor easy to move. Instead of purchasing a target, make your own and spend the money you save on other archery equipment. Targets are easy to construct from many inexpensive materials. Once you have built your target, add paper targets or animal photographs to the front if you wish. Place your target in a safe place, and test it with a few old arrows before firing a few of your favorite shafts at your new DIY target. Good targets stop any arrow that hit them; but the best targets do not allow arrows to penetrate very far. This makes it easier to remove the arrows later. Additionally, targets should be large enough to catch the occasional off-target shot – experienced archers can get away with relatively small targets, but beginners should use targets that are at least 24 to 30 inches long and wide. Portable targets are preferable to those that are too heavy or bulky to move easily. This is important for the long-term durability of your target, as indoor storage maximizes its lifespan. Compression targets utilize a stack of layered material – cardboard, foam insulation board and carpet swatches are some of the best materials – to stop an arrow. To keep the material tightly compressed, build two square or rectangular frames from 2-by-4s; make the frames a few inches larger than the length and width of the cardboard, foam or carpet. One frame forms the bottom of the target, and the other forms the top. Drill a hole in each corner of the frames, and pass 36-inch threaded bolts through the bottom frame, past all of the layered material and through the top frame. Thread nuts onto the protruding bolts and tighten them down as far as you can. Experiment with the tension until it is tight enough to stop your arrows, yet still allows easy retrieval. A simple way of making an archery target is to glue several sections of foam together. Glue each section face-to-face, to make a thick “book” of foam boards. The ideal thickness for the target varies based on factors such as the draw weight of your bow, the distance to the target and the type of arrows and points being used. Building box targets requires a little more work than building compression or foam targets, but they are still worthy of consideration. Build a wooden frame measuring approximately 24 inches long by 24 inches wide by 12 inches deep. Attach chicken wire to the back of the box using heavy-duty staples. You must then fill the box with a suitable material, such as scrap denim. Pack the material into the box very tightly, and then attach another piece of chicken wire to the front of the box. Cover the chicken wire on both sides with flexible landscaping cloth to finish it off. The Hunting Headquarters: DIY Archery Target – Build A Good One For Cheap! Archery Essentials: How Do I Make an Archery Target?